CA-72 was also sent 31a/9C on 11/24/44, but it was never used. 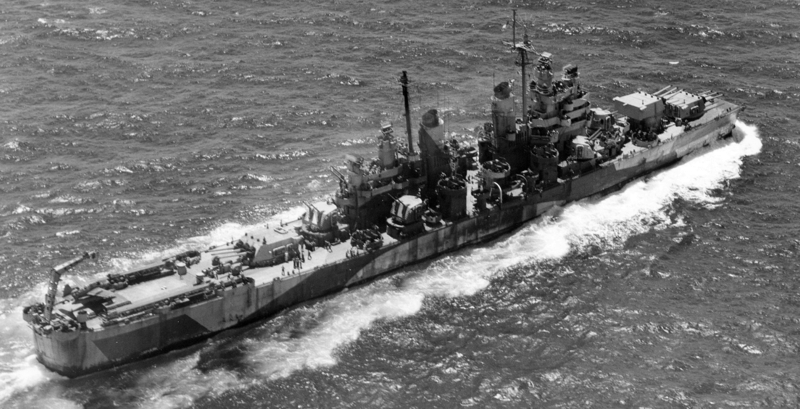 The USS Pittsburgh (CA-72) off the Atlantic coast on November 1, 1944, in camouflage 33/18D. The vertical colors used were navy blue (5-N), haze gray (5-H) and pale gray (5-P). 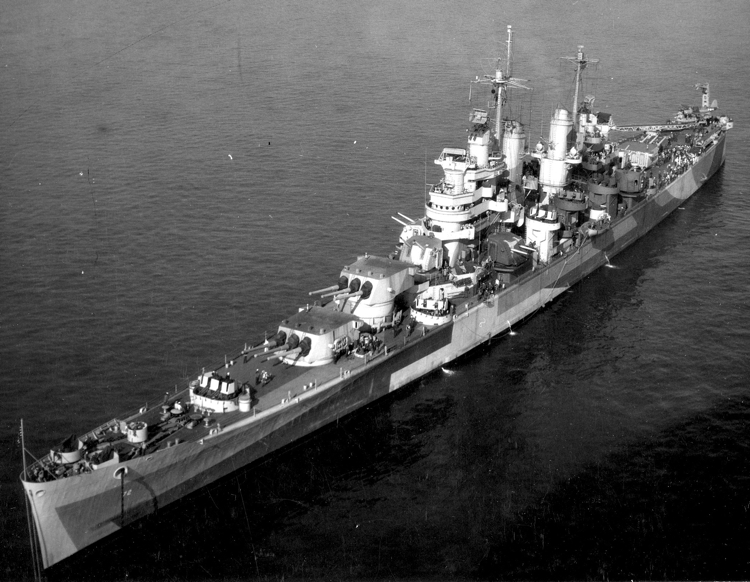 Pittsburgh had been commissioned on October 10, 1944. Pittsburgh is seen again in an almost overhead view on November 1, 1944. This series of photos was taken by blimp squadron ZP-11. This also gives a good view of the deck pattern. 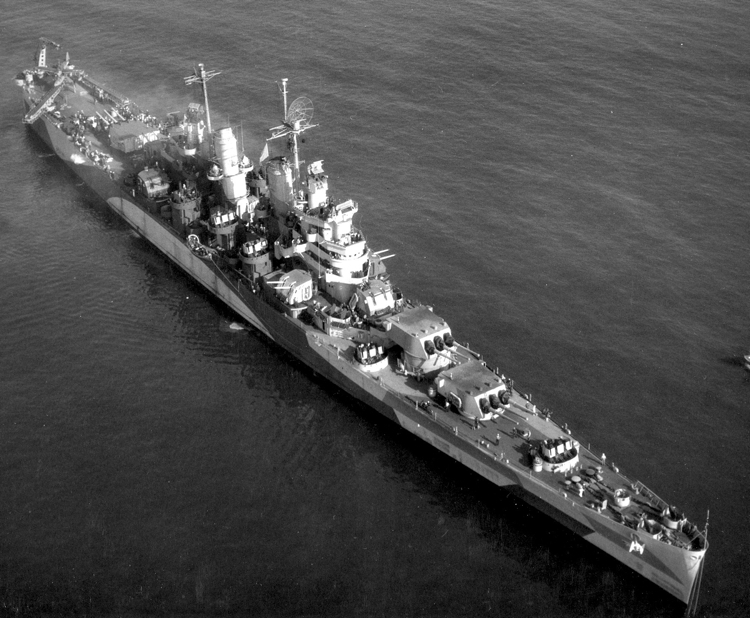 USS Pittsburgh (CA-72) in another aerial photo taken by ZP-11 on November 1, 1944, wearing camouflage 33/18D. Pittsburgh again taken by ZP-11 this time on November 3, 1944. This is USS Pittsburgh (CA-72) in another aerial photo this time taken by squadron ZP-24 on November 8, 1944, about 75 miles off Virginia Beach. USS Pittsburgh (CA-72) in another aerial photo this time taken by squadron VJ-4 on November 11, 1944. A little difference in lighting and exposure produces different tones on the paint. Photo source: NARA 80-G-272496. The USS Pittsburgh (CA-72) on June 10, 1945, showing a damaged lost bow from a typhoon on June 5 still in camouflage 33/18D. Photo source: NARA 80-G-289719.